Don’t Let Outdated Filters Cause Fires. We Replace Them with Modern Baffle Filters. 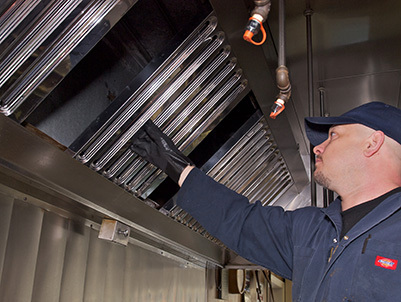 According to the prestigious National Fire Protection Association, most of the fires that occur in commercial kitchens are caused by cooking flames that flare up and penetrate greasy filters. 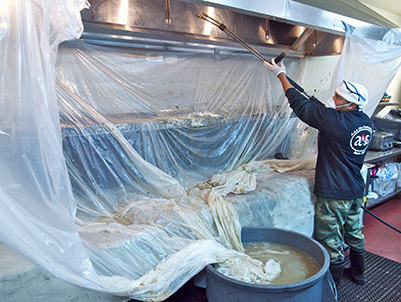 While it is true that a completely clean filter can usually trap up to 80 percent of the grease passing through them, in most establishments the efficiency of filters is far less because it is a challenge to constantly clean the filters. Grease accumulates quickly. Once the grease ignites, it can potentially cause a great deal of damage. Don’t risk it. There is a whole new generation of baffle filters that can remove virtually all of those worries. A baffle filter is made to remove microscopic grease droplets from the exhaust air stream. The filters use a system of tiny baffles that trap the droplets and they can be easily and quickly cleaned without the drudgery of using harsh solvents. At the same time, baffle filters optimize air flow, making the entire exhaust system more efficient. These filters are a breakthrough technology. 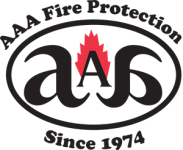 AAA Fire Protection Services "Grease Filter Exchange Service" will remove your grease-laden filters and replace them with modern, 18-gauge galvanized, UL-listed, "Grease Baffle Type Filters" that meet local codes and National Fire Protection #96 standards.